Now, Thorek Memorial Hospital is proud to offer the most minimally invasive surgical technology available – the da Vinci® Surgical System - to our patients. 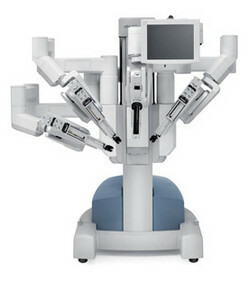 The da Vinci® Surgical System provides surgeons with an alternative to both traditional open surgery and conventional laparoscopy, putting a surgeon's hands at the controls of a state-of-the-art robotic platform, allowing surgeons to perform even the most complex and delicate procedures through very small incisions with unmatched precision. "The potential payoffs [of the da Vinci Surgical System] are impressive: Smaller incisions, less pain, fewer infections and other complications, shorter hospital stays, faster recovery, even improved odds that the outcome of the procedure will be a success." Click here to learn how the da Vinci system works.